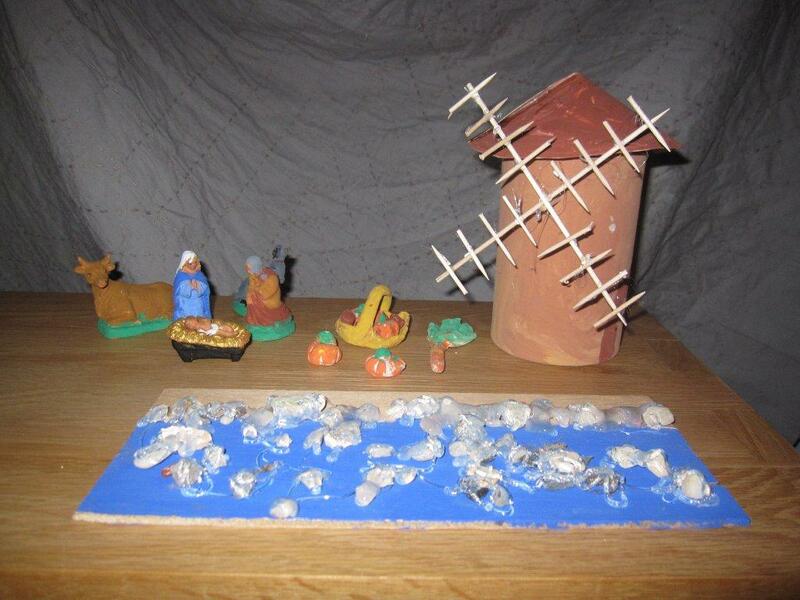 There’s a Windmill in my Creche! 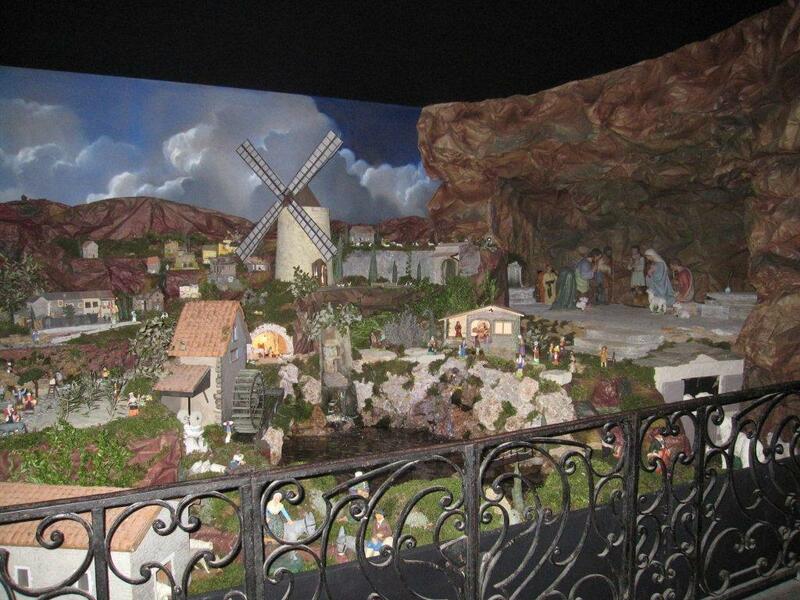 The Drome area of Provence takes their nativity scenes very, very seriously. Every church has a beautiful and intricate creche. 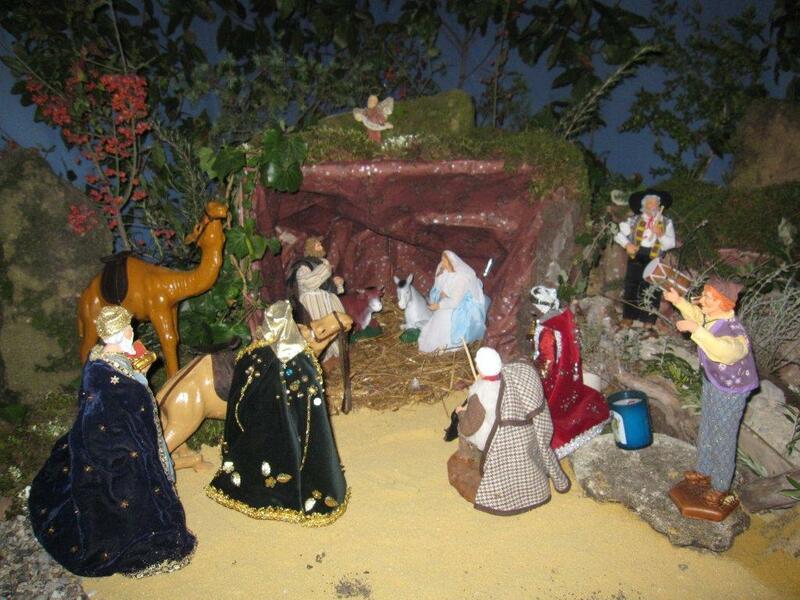 Our village has a contest among the children for the best creche. If you look closely at the picture, you’ll realize that there is something missing – there is no baby Jesus! 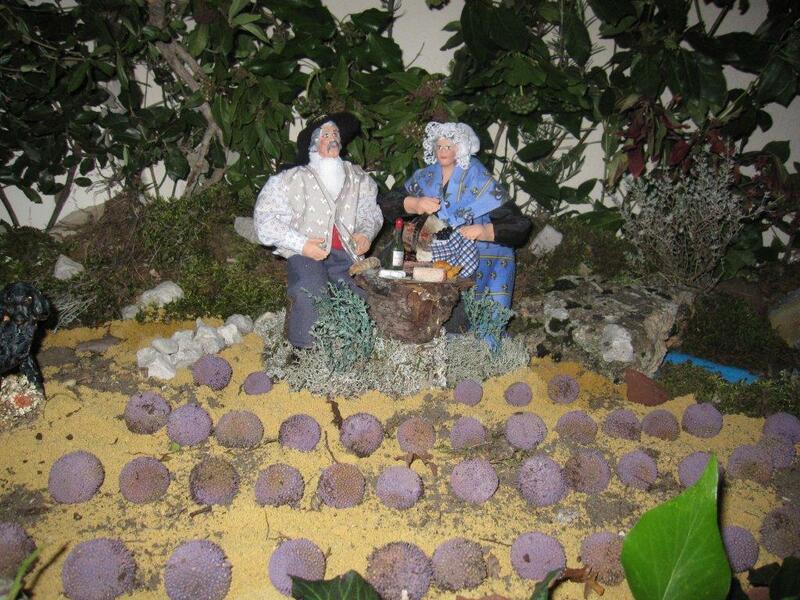 When I first saw the creche I thought it was incredibly sad that somebody would take advantage of a church’s open door to vandalize a nativity scene. But then I realized that he was missing from all of the creches. This is part of the tradition and baby Jesus will appear on Christmas Day. The figures in these creches are quite spectacular. The attention to detail is stunning. One of my favorite character groupings is this one with the lavender. Lavender??? Yes, the Provencal creches mix the traditional Mary, Joseph, shepherds, and wisemen and put them side-by-side with scenes from 1800s Provence. 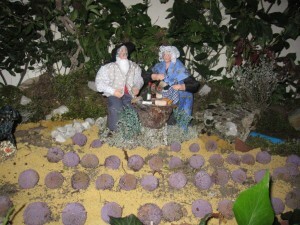 Typical figures include farmers, washer women, fishermen, millers, and hunters, and the scenes typically have a stream, a field of lavender, a windmill and much more. The larger creches are animated with running water, horses that walk around, millers that carry flour back-and-forth and so on. At the creche in the “big” village near us, you can deposit 2 euros to start a complex animation that cycles from morning to sunset. Our girls love it. 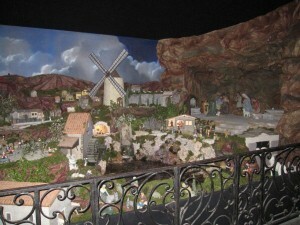 This mixing of the biblical nativity scene with 1800s Provence extends throughout the Christmas tradition here. We saw a Pastoral last weekend. It was fun to follow Mary on her donkey to the salle des fetes to see the performance (but had to be careful where we stepped!) The service started with with angels and shepherds singing some traditional carols, but then the miller, the hunter, and various other Provencal characters made an appearance as well, each bringing a gift for the little baby Jesus. Our girls took a class here in our village to make their own creche. Of course this is our first year so we don’t have the full set yet, but we have a good start on the basics: Mary, Joseph, Baby Jesus, cow, donkey, potatoes, pumpkins, windmill, stream, and even a HUGE CARROT. Loved this post, Diane…I’ve never seen the creches with all the references to 1800s Provence…sounds wonderful! BTW, we should ship our 3 donkeys over for the Holiday season. They would really get in the spirit of the season, I’m sure! Very charming! I love that Baby Jesus and crew have a waterfront site. And how very lucky they are to have such an enormous carrot. That’s one of the best parts of being there yourself — seeing the parts of the culture that don’t make the evening news. Thanks for sharing!